Look at that balls out enthusiasm! Testicular cancer awareness week, held in Macewan Student Centre from November 16-20, aimed to promote awareness and the need for self-checks of testicular cancer in males. Cards highlighting how to properly self-check for abnormalities were distributed throughout the popular university venue. Pairs of balls were also hung up with these cards across the University campus’ hot spots, to help promote Oneball to the general university population. Volunteer Reid Collins states, "Not many clubs on campus advertise in this way. Personally, I'd be intrigued by big blue and yellow balls hanging from a tree. It's all about evoking curiosity and spreading awareness." This is...exactly what it looks like. 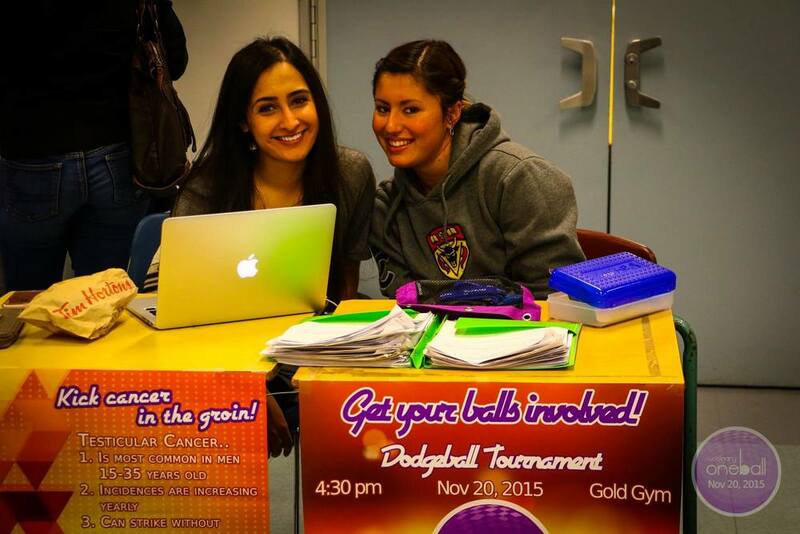 Our dodgeball event, the Oneball Ucalgary Sackdown, kicked off on November 20 and was the Calgary chapter's most successful event, rallying more than 100 individuals together to promote the significance of the disease. Congratulations to Big Bang Balls who won the event, and a huge thanks to everyone who came to spread awareness of testicular cancer. This is either an existential crisis moment, or a 'what am I going to eat after' moment. "For their first ever dodgeball tournament here at the university, it really beat my expectations. To have 12 teams participating is a feat in itself," student Max Kurapov said after taking home gold. He went on to say "the atmosphere was unbelievable. Oneball has great potential to further their awareness across campus with events like this." And it’s not just Max that feels this way, other students see the value in these types of awareness events as well. Sarah Albers believes these events make testicular cancer easier to speak about publicly, saying, "Despite being such a deep and saddening type of cancer that is often not discussed, Oneball has made the topic more approachable with their incorporation of fun filled events like this." Our exuberant Oneball UCalgary President Igor, likely describing what it's like to hit someone in the face with a ball. As the semester winds down, we would like to thank the executives, volunteers and University of Calgary students for helping make Oneball Ucalgary’s first semester a very successful one. There's still plenty left in the sack, and we hope to see you out there! From our balls to yours! And before you go, make sure to check out the rest of the Oneball Ucalgary Sackdown photos below! Members of our awesome Oneball UCalgary executive team doing some great work! This is the exact moment before she had OneBall. This picture is the embodiment of "'who you gonna hit?' 'I don't know, who you gonna hit?'"